Length: 9.75", 10", 20", 30", 40"
Packaging: 25 or 50 pcs in one big carton,or according to customer's requirement. - Particles removed through the entire depth of filter cartridge. We are manufacturer of PP Filter Cartridge. 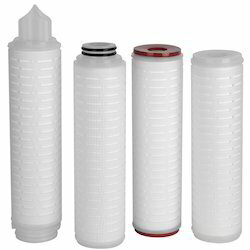 Being one of the trusted organizations in the market, we are indulged in providing a wide range of PP Filter Cartridge. - String wound cartridge nominal rated polypropylene wound cartridges are widely used as a pre-filter for economical filtration. It is available in different media and core for wider chemical compatibility. Our company is committed to provide best quality of Pleated Polypropylene Filter Cartridge. This Pleated Polypropylene Filter Cartridge is made up of latest technology and finest quality material. This Pleated Polypropylene Filter Cartridge is tested at various levels as per the world class standards and parameters.